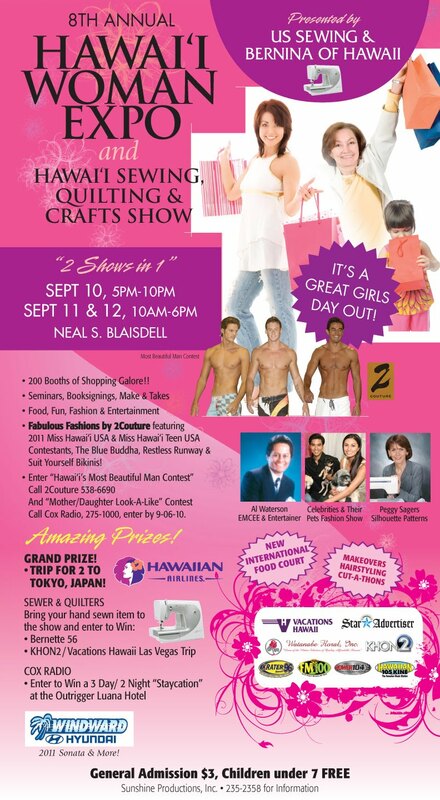 I've been working hard since Quilt Hawaii in July to get ready for the Hawaii Woman Expo in Honolulu on September 10-12 at the Blaisdell Center. The three-day expo includes not only products and services geared specifically for women but also sewing classes, arts and crafts vendors, entertainment all three days and lots more. You can get all the details here. This is the first time I'm taking my scarves "on the road" so to speak and having to pack everything in two suitcases is a bit of a challenge. I can rent tables and chairs so no shipping involved there but I still have drying racks for displaying additional scarves and the wire racks I use to add height to my display. Right now it appears that the most economical plan is to just take my scarves, cards, bags and credit card machine with me and buy the racks in Honolulu. At the end of the show I will either give them to another vendor or attendee or donate them to a thrift shop. So if you're in Honolulu that weekend, be sure to stop by and see me. I'm in Booth 96, a couple rows away from the stage area. I can't wait -- three days off island doing what I love and staying in a nice hotel. Aah - what could be better?